Holding Switch "made me excited for this generation of Nintendo games"
When a game is described as a 'rolly roguelike' and comes with an intriguing trailer, it's certainly a good idea to sit up and take notice. TumbleSeed is expected on the Nintendo Switch this Spring and is the work of aeiowu, a '1-person developer' that's also a collective - in this case - of creative game makers. The enthusiasm for Nintendo's new system leapt out of the recent announcement of the title coming to Switch, with bold ideas of making the game a 'flagship' for HD Rumble, as one example. It's a fascinating game, so we caught up with Greg Wohlwend, the man behind the studio; he's working with Benedict Fritz, David Laskey, Joel Corelitz and Jenna Blazev on TumbleSeed. Wohlwend's own track record includes definitive smart device titles - such as Threes and Ridiculous Fishing - and also showcases a strong passion for gaming of all types. TumbleSeed may also be coming to PS4 and PC, but his enthusiasm for Nintendo's system is undeniable; if that excitement translates into the game it could be an alluring release on the console. Can you tell us a little bit about your team and your backgrounds? Where did the concept for TumbleSeed come from, and what titles would you say provided inspiration? It's a bit circuitous but I'm Greg - AKA aeiowu that's a 1-person developer. Benedict does this as well, so does David, Jenna and Joel. We all do our own thing. So this is our first time all working together. That's sort of how all of us operate. We float around until we land on a project that interests us. From my perspective, its sort of like being in a band and I wouldn't have it any other way. Everyone has valid input and we specialize in our areas but in the end it's a big messy collaboration full of everyone's passion; it's oftentimes disorganized, but somehow in the end it works because you're making something you truly believe in with people who believe in each other. For the team's background in general: We all live in Chicago. I met Benedict first at a random game development event in Chicago and we got along pretty easily, so I invited him to come work a day or two out of the co-working space I work in. We became fast friends and we'd co-work every once in awhile since he lived in the neighborhood. Yada yada yada we started getting really into Killer Queen, which David Laskey was also into. The Chicago Killer Queen scene was one of the biggest and most avid in the country at the time so we'd hang out more and more at arcades. One arcade machine they had there was Ice Cold Beer. It's a physical arcade cabinet made out of wood. The bar and ball were metal and the object was simply to avoid the holes and get your ball into the goal. It's insanely hard, but in a great way. After playing for an hour or so you can easily look back on your progress of how you've assimilated to this strange indirect control scheme. I always found it very elegant that two control sticks and one axis could produce so much expression from a player. Also, making your path between holes was very cool and reminded me a lot of mountain climbing. You'd see your gap, balance, get set, then spring through while still holding absolute control of where you'd stop. Switch, just as an idea, doesn't really hit home until it's in your hands. But when it is, then it makes an unbelievable amount of sense. So much that it feels obvious in hindsight. Why didn't we always have this? Anyway, one day Benedict prototyped Ice Cold Beer in Unity. It was an extremely simple white background with black circles for holes. If the ball touched any of the black circles, it was game over. He made a vine of it and I saw it soon after and thought, man, I wanna make that game too. We both found it incredibly easy to dream up ways to honor the beauty and secret depth of Ice Cold Beer by making it procedurally generated, adding enemies, a world and so on. There are many limits on a physical arcade cabinet that relies on wood and metal, but in a digital game there are nearly none. But that turned out to be more of a liability than an asset. We spent the next couple of years mucking through dozens of prototypes. From survival score attacks to tilty-mobile dungeon crawlers to open-world action adventure Zelda-likes, we ran the gamut. Because nobody has really embarked on bringing Ice Cold Beer to the world of videogames, we didn't have much previous knowledge to rely on. So searching for that puzzle piece took forever because we couldn't pick a direction. Another reason it took two years was how stubborn we were with the design. It's really important to us to honor Ice Cold Beer and not just make the same game but digital and procedurally generated. We wanted to find a design that brings what we saw in the original and add in our own sizable contribution to make something greater than the sum of its parts. What were your thoughts when you first saw the Switch? "Wow." Or maybe: "Cool." I'm not sure which exactly but I do know holding it for the first time made me excited for this generation of Nintendo games. I immediately saw myself carrying it with me in my backpack everywhere I go and also using it as my primary game console at home. Switch, just as an idea, doesn't really hit home until it's in your hands. But when it is, then it makes an unbelievable amount of sense. So much that it feels obvious in hindsight. Why didn't we always have this? It's even how I play most PC/Mac games these days: I put my laptop on the coffee table and plug in my HDMI and a controller. It's a pain because I have to do x, y, and z and I can't play games easily on my laptop in bed. So it just fits with how I want to play videogames in all ways. The other stuff, the details, are all right too. It has a nice weight to it, the controllers are really well done. The screen size is perfect where I don't feel I'm missing out on details because it's too small or anything. It's a beautifully designed object. TumbleSeed as a concept existed before the Switch was revealed. How have you adapted the game to play to the unique strengths of Nintendo's console? It did, but we've been working with Nintendo since June and thinking about putting TumbleSeed on the Switch even earlier than that. 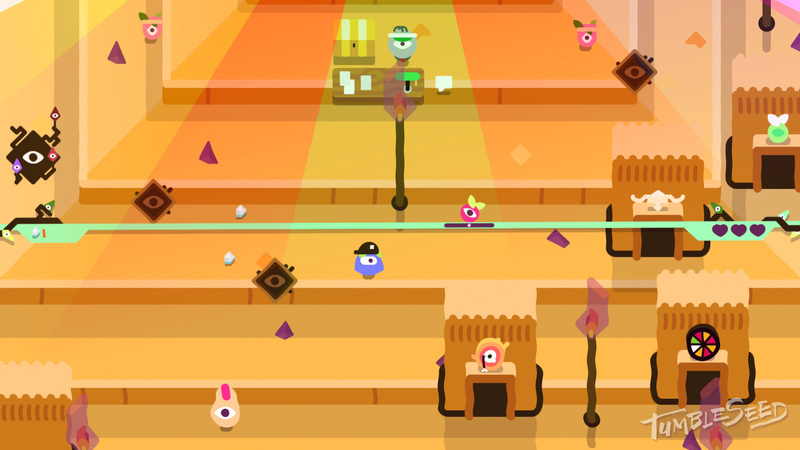 TumbleSeed has always felt at home with Nintendo in general. We've gone to great pains to make our super-weird nothing-like-it (which is sometimes a bad thing because people get confused) game easy to learn and also great pains making it challenging the 1000th time you try to scale the mountain. I still find our game fun and I've been playing it for years now. That hearkens back to earlier Nintendo days of the very hard games that I grew up with beating my head against. 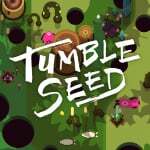 But that only speaks to the audience and Nintendo community, as for the console hardware itself we are working hard on making our game feel amazing with HD Rumble as well as a feature or two that we don't want to talk publicly about because it hasn't gone through enough testing yet, but making TumbleSeed special on Switch is a top priority of ours. What's it been like working with Nintendo as an indie studio? It's been great. Nintendo of America feels like a true partner in this with us. We're sharing in the excitement of the console launch together and that energy is contagious and positive. How easy has it been porting the work you've already done to the Switch? For the most part, surprisingly painless from where I'm standing. Though we have this secret weapon called David Laskey who makes it look easy. He's incredible. Also, we couldn't have done it nearly as quickly without all the hard work from the folks at Unity and those over at Nintendo for working together to make that happen. What's the most appealing aspect of the Switch, from a developer's perspective? I think what's appealing is how I'm as excited for this console as I was when I stood in line for Twilight Princess and a Wii. While the Wii brought us innovative motion controls that blew our minds, the Switch brings me a new way to integrate videogames into so many different aspects of my life. That's really powerful. It may not seem like it from a few commercials, but once it's in your hands and you're putting it in your bag, then up on the television, 2 player on the train... I never want to go back. That's all from a player's perspective but I maintain it even on this side of the fence. If I'm honestly excited as a player, then the same is even more true as a developer. I think what's appealing is how I'm as excited for this console as I was when I stood in line for Twilight Princess and a Wii. You've mentioned that TumbleSeed could be seen as the "lead" title for showing off the potential of HD Rumble on the Switch. Can you explain how you'll achieve this? In TumbleSeed you're always rolling and that's pretty unique. "Roller" isn't a genre... yet. So because you're always rolling around, changing speed and direction we wanted to translate that directly to HD Rumble and give you an extra sense through the high fidelity vibration. It actually helps people sense where they are and what they're doing in the game in a level of detail that's meaningful far beyond "explosion" and "bigger explosion". I'm no writer, so it's hard to put down in words but you'll just have to feel it for yourself. Could we see exclusive content on the Switch version of TumbleSeed that isn't available on the other editions? It's possible. I know that's annoying but we'll have to keep it there for now. Now you've had the chance to work on the Switch, do you have any ideas floating around for exclusive projects which could push the console's feature-set fully? Yes, definitely, but we gotta finish this game before we start the next one! We'd like to thank Greg Wohlwend for his time. I have to say this game looks ace and his enthusiasm for the Switch is infectious. @Mellor2000 Yeah, this interview has got me interested in this game. I'm looking to experience what HD rumble will bring to it. Was this game initially intended for phones? I get a mobile feel when watching the vid. It's been said before but I think the Switch is a play it/see it in action sort of console. I think people will get excited when it's in their face. Hopefully developers all get as excited and we get a generation of exciting games. oh, man — it's the ridiculous fishing guy. jim sterling gave it a game of the year award. Don't know how he figures this game is a roguelike, it's nothing like rogue. @peeks probably because there hasn't been any AAA game announcements such as a new Call of Duty, Assassin's Creed, Battlefield, etc. The games I can think of have already been released on other platforms. Besides, I don't think people want THAT many ports on this system or that they could get a better deal on other systems. Remember Mass Effect 3? @mmarkster Exactly. Everyone complaining about how sparse the Switch launch lineup looks needs to remember that Wii U launched with a ton of games, but because there were so many and they were ports of games that had been out a while none of them sold. If Switch had a launch like that the same thing would happen all over again, only worse because of Breath of the Wild. So if Nintendo is getting third parties back on board I'd like to think everyone realizes that new games are required, even if they take a while. And if that's the case perhaps Nintendo is trying to time announcements to build the most momentum throughout the year leading up to the holidays instead of dumping it all now, when it won't affect sales. This looks great, Keeping my eye on this game! I'll be keeping an eye on this title, could be fun. @KIRO Me too! As much as third party support is getting promised for Switch, to me it feels like more of this sort of game as opposed to AAA experiences...and no way am I saying that is a bad thing! What the hell is a "rolly roguelike"?? @peeks Well, it's not THAT old: it's Skyrim Special Edition, and that was released in October 2016. And besides that, mods are still shared and played as well, and there has been talk of the Switch version also supporting that. @feelinsupersonic If only that "award" actually meant anything. @IronMan28 i assumed it means he really liked the game. maybe i need to look harder at it, since you're suggesting some sort of conspiracy. thanks for the heads-up. This looks great. What a great way to highlight HD rumble. Sorry if this has already been discussed - but it would be a step forward if developers used HD rumble for blind as well as/or deaf players in mind. Blind gamers could possibly have a fully realised adventure game with sound and high fidelity rumble stimulus, likewise deaf players could use visual and rumble stimulus. I hope this is something that can evolve outside the norm. It's all about immersion for different players, and this could be a positive possibility. "wtf does rolly-roguelike even mean?" "Nobody knows what it means but it's provocative!" Well that's the thing. While it is great to have these developers onboard the games that really matter to those who are not diehard fanboy are the AAAs. The games that sells systems are the one's always on TV saying "available now on the PS4 and XboxOne"
By next year it will be great to hear "available now on the Nintendo Switch" on our TV screens. After blowing a few million on the Super Bowl ad it would be great to keep the system on the TV, like the other consoles. However I insist on telling those who are willing to listen, please wait for E3. E3 will give a far clearer perspective on the Switch's AAA 3rd party potential, one way or the other. @KIRO Oh wow! That's amazing! @peeks well there's Steep and FIFA 18. I guess many are just waiting to see how well it sells. WiiU had the likes of Arkham City, Darksiders 2, Call of Duty, Assassin's Creed 3, Deus Ex ...nobody bought them despite several being considered the best versions due to the gamepad implementation (even if they were behind graphically), and then to top it off the system itself didn't sell amazingly. Plus it's a Nintendo system launching with the most anticipated Zelda game yet, nobody wants to compete with that at launch and few realistically could. But this article isn't about that is it? Sure it's something we all want to see but instead of focussing going on what others aren't bringing let's focus on what this developer is bringing! The game looks and sounds lovely, the dev is clearly passionate about their game and the console. Plus it shows that the HD Rumble feature many are already dismissing as an unnecessary extra is actually something that third parties are getting getting really excited by - all really positive things! I'm looking forward to this game very much, especially with the focus on the HD Rumble. This, Snipperclips, Fast RMX and SnakePass will all make for great small but quality titles to help round off my Switch library at launch. @feelinsupersonic " i assumed it means he really liked the game. maybe i need to look harder at it, since you're suggesting some sort of conspiracy. thanks for the heads-up." LOL, where do I begin? First, I'm not suggesting a conspiracy. I'd like to know how you took that from my post. It's like I told you to go to the lake and you drove to the oceanfront. Second, GOTY is a meaningless award since many outlets and individuals have it. My comment was more a jab at people who take that designation too seriously, like some of the trolls here who have joked this game is "GOTY!!!" even though it does look very good. @IronMan28 exactly. this game looks good, and that game by the same guy was deemed a top-5 game out of the hundreds of games played that year by my favorite critic — a critic who cannot be bought, clearly. of course we're talking about this monumental waste of time that are video games, so everything is meaningless. but, within this meaninglessness, jim's opinion is as important to me as it gets, and, even though games are meaningless, there are way too many for me to just go into them blind hoping they don't make me even more bored than before. so i was sharing jim's opinion on this developer to help steer people here toward what's looking like a good game. but of course this is all evident. the conspiracy part was just a brilliant joke i made. because why else would someone point out that jim's opinion is irrelevant? well, yes it is, as in, it's not global warming. but he's a video game critic, and people here care about video games.